Modern lighting design and installation in the industrial space has shifted in focus over the last 10 years, from providing easily serviced lighting systems which provided high lumen output, to providing high quality illumination which encourages the highest productivity and worker morale while also providing greatly improved energy efficiency. As the cost of energy rises, more and more emphasis is being placed on utilizing high efficiency lighting systems within the industrial work space in an effort to help moderate the increases in operating costs that electrical power consumption represents. Adding to the impetus to improve efficiency are new energy standards and regulations contained within the Energy Independence and Security Act of 2007 and the 2005 Energy Policy Act. Without going into the complex specifics of these regulations, suffice it to say that the efficiency requirements which many types of lamps must meet are now substantially more stringent than a decade ago. While on the surface it may seem that tightened energy policy and regulation might perhaps create a logistical and financial burden not only on lighting manufacturers but end users as well, there are a host of mitigating factors which preclude such a possibility. In fact, the new legislation now beginning to fully phase into effect has served to not only promote more efficient energy usage across the board, but created and opened up new markets and provided many industrial operations with a cost effective opportunity to finally upgrade their existing lighting systems as well. Once it became clear that current lamp designs were no longer going to be capable of meeting energy efficiency standards, manufacturers were very quick to ramp up development of new lamp designs and new lighting technologies. Many manufacturers concerned with public perception and the difficulty of introducing new technologies have opted to pursue improving current incandescent lighting technologies, albeit with limited success. Incandescent halogen bulbs capable of meeting new energy requirements have been the primary avenue of improved incandescent lighting design, but remain limited in their scope and practicality due to the constraints imposed by their fundamental design limits. Incandescent technology has proven notoriously difficult to enhance, and the reliance on the principal of electrical resistance to produce light energy will forever remain an area of poor benefit. New lighting technologies such as solid state luminaries or “LEDS”, however, have shown great promise and are currently at the forefront of new lighting design due to their extremely efficient operation and still as yet undeveloped vast potential. Whereas incandescent lighting development has for most intents and purposes reached the end of its developmental practicality, LEDS are only now beginning to achieve even half of their potential. LEDs are not only capable of easily meeting compliance with new regulatory standards, but hold the potential to continue meeting compliance well into the future as the need for increased efficiency results in almost certain higher efficiency standards at later dates. While the incandescent bulb is expected to eventually become wholly replaced by new lighting technologies, this does not in any way imply that consumers or manufacturers can expect increased costs or reduced revenues respectively from switching to advanced lighting systems. The moment President Bush signed the Energy Independence and Security Act of 2007, developers were already in the process of redirecting development focus onto new technologies like LEDs. Although some manufacturers maintain a notable amount of investment in incandescent lighting design and development, shifting to new technologies has allowed the creation and realization of entirely new marketing and sales branches that will easily overshadow the discontinuation of incandescent lighting. Not only this, but because of the highly specialized electronics and materials required for the development and manufacture of LEDs, entire new markets dedicated to providing these electronics and raw materials have appeared and exploded in growth, producing economic growth and opportunity outside the lighting industry. Because of how significantly the focus of manufacturing has shifted towards efficiency and the rising costs of energy, the focus on industrial lighting design has also shifted towards utilizing illumination more efficiently as well. Where once it was considered sufficient to simply install enough lighting to illuminate a certain area, designers now seek to illuminate larger areas, using far less power, while improving light quality as well. Although a tall order to fill, this is entirely possible now with modern LED lighting due in large part to the extreme efficiency and versatility of the LED. LEDs already have the advantage of an excellent wattage to lumen ratio, with 60 to 90 lumens per watt now being the norm compared to the incandescent bulbs’ 15 lumens per watt. On paper, that would mean that an area once requiring 50,000 lumens of illumination needed 3,300 watts of lighting to meet requirements. 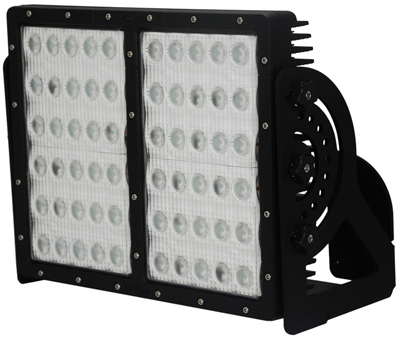 However, with LEDs, even assuming a low 60 lumen per watt ratio, 830 watts could provide the same amount of lumen output. On paper this seems great, but since many other factors such as delivered foot candles and perceived brightness can skew real world results, it pays to look at real world examples when making a comparison. Fortunately, with LEDs there is no shortage of studies and one need only look to the news for a wealth of real world results. -A study by independent group LightSavers found up an up to 85% reduction in energy use with LEDs across a 2 year study of 12 cities. -In limited testing projects, the city of Raleigh, North Carolina has noted savings of $175,000 just with these small test programs in place. -A Denny’s restaurant owner in Joliet Illinois has reported an up to 85% saving in energy consumption from lighting with a switch to energy efficient LEDs. Such examples are widespread and continue to grow in number as more business planners and lighting designers move to embrace LED lighting technology. Making the switch even more attractive are federal and state incentive programs that provide tax breaks, rebates, and assistance for businesses that wish to switch to energy efficient LED lighting. Many of these programs allow business owners to not only keep the cost of upgrading comparable to a full install of traditional lamps, but recoup investment and show a net savings in as little as one year. Overall, the new regulations being enacted although at first glance seemingly a costly proposition for industrial and commercial businesses which must bear the eventual costs for these new designs, are in reality an opportunity to improve net profits over the long term. Reduced energy usage and incentive programs make initial outlay less prohibitive, and fast returns through reduced operating and utilities costs provide benefits that demonstrate just how effective the new energy policies now beginning to take effect can be once fully realized.